By Michael Dickey, James Doehring, Al Globus, and other members of the Lifeboat Foundation Scientific Advisory Board. This is an ongoing program so you may submit suggestions to [email protected]. Ark I is a self-sustaining space colony built to ensure humanity could survive disasters that make Earth uninhabitable such as nanoweapon disasters or particle accelerator mishaps. We are moving towards a world with less and less privacy. Your credit card reports and bank records are available to almost everyone, your phone calls are tapped, cameras are being placed everywhere, etc. This will only get worse when more powerful weapons are available to the individual. In the future, if you wanted a lot of privacy, you couldn’t live with billions of people whose lives depended on what you did. So instead you could live on a small spaceship with a couple thousand people who trusted each other. The air in each station will be at one third atmospheric pressure. It will be 60% oxygen and nearly 40% nitrogen, with less than 1% carbon dioxide. The nitrogen will suppress fires and the carbon dioxide, mostly expelled from occupants and waiting for reprocessing, will contribute toward plant growth. The one third of atmospheric pressure will reduce hull stress. The humidity will be kept between 30 and 50 percent. 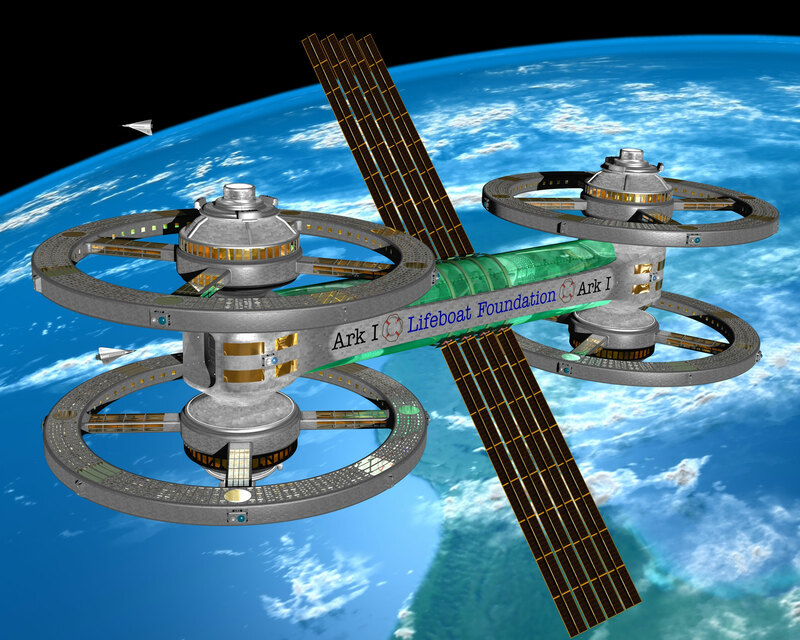 Learn about the design/construction of Ark I.
Ark I’s living quarters will be mainly located in four large wheels which rotate to generate artificial gravity. The wheels have a radius of 150 meters and rotate at 2.4427 revolutions per minute to generate 1 gravity for outer wheel rooms and .7 gravity for inner wheel rooms. The disorientating effects of simulating gravity using rotating wheels decrease as the diameter of the rotating structure increases. Ark I’s habitat rings will be large enough to make these effects unnoticeable and to comfortably house each rings 250 occupants, but not so large as to make construction too difficult. One third of the living quarters will be in the main bridge where there will be no artificial gravity and these living quarters will be primarily used by visitors. For periods of time up to a year, people have no problem and no permanent side effects from living in weightlessness. In fact, most astronauts enjoy and look forward to time spent in weightlessness. Based on the early successes of the Mir Greenhouse experiments, we intend to support plentiful plant life both in the simulated gravity rings and in the gravity free environment within Ark I’s connecting bridge. Plant and animal life will help to maintain a more natural and inviting feel to Ark I. See this example of Dwarf Wheat plants growing under LED lighting in zero G! Excess heat will be radiated away from the station through heat radiating panels that are attached at a 90 degree angle to the solar panels. 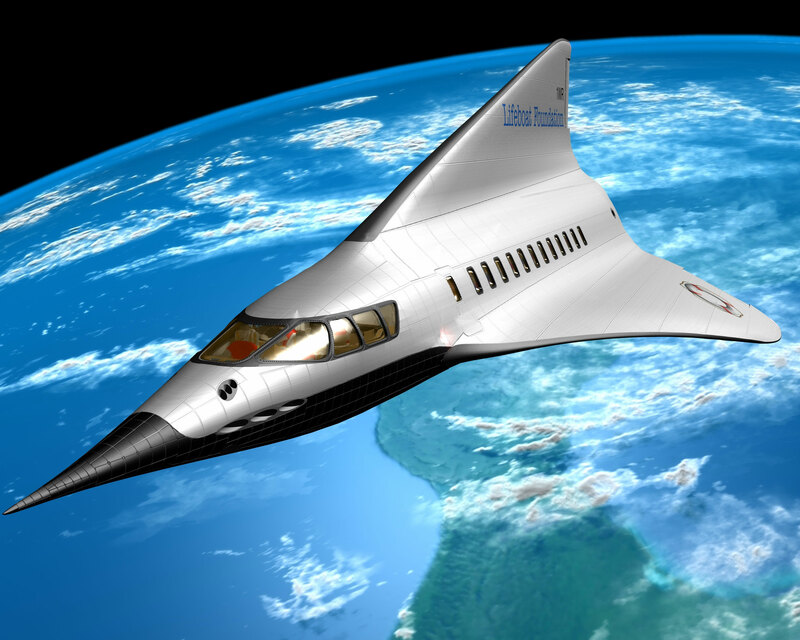 Ark I will be initially placed in orbit around the Earth at a height of 400 kilometers (248 miles) to make it easier to engage in trade and tourists from Earth. 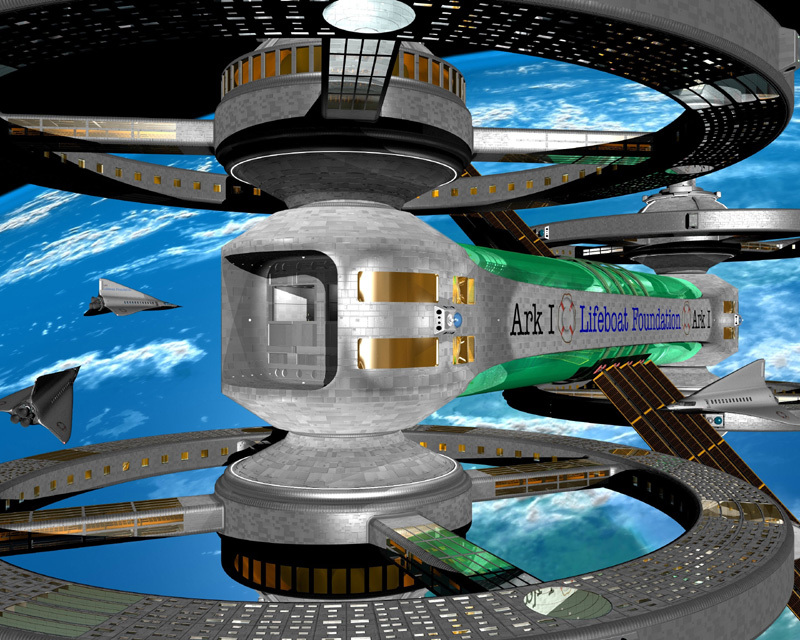 Both it and the other Arks will be moved further away from the Earth as the project progresses. Earth-normal “gravity”. The Moon and Mars have a surface gravity much less than Earth normal (which is called 1g – the g stands for “gravity”). The lunar surface is at roughly 1/6g and the Mars surface is roughly 1/3g planet. Children raised in low-g cannot be expected to develop bones and muscles strong enough to visit Earth except in desperation  it will be too painful and exhausting. For example, if a person who weighs 73kg (160 pounds) on Earth went to a 3g planet, the equivalent of moving from Mars to Earth, they would weigh 225 kg (almost 500 pounds) and would have great difficulty getting out of bed. For children raised on the Moon or Mars, attending college on Earth will be out of the question. By contrast, orbital colonies can rotate to provide any g level desired, although it’s not true gravity. Spinning the colony creates a force called pseudo-gravity, that feels a lot like gravity. Pseudo-gravity is much like what you feel when a car takes a sharp turn at high speed. Your body is pressed up against the door. Similarly, as an orbital space colony turns, the inside of the colony pushes on the inhabitants forcing them to go around. The amount of this force can be controlled and for reasonable colony sizes and rotation rates the force can be about 1g. For example, a colony with an 895 meter (a bit less than 1000 yards) radius rotating at one rpm (rotations per minute) provides 1g at the hull. Children raised on orbital colonies should have no trouble visiting Earth for extended periods. Great views from Earth (and eventually other planets). Space colonization is, at its core, a real estate business. The value of real estate is determined by many things, including “the view”. Any space settlement will have a magnificent view of the stars at night. Any settlement on the Moon or Mars will also have a view of unchanging, starkly beautiful, dead-as-a-doornail, rock strewn surface. However, settlements in earth orbit will have one of the most stunning views in our solar system – the living, ever-changing Earth. Weightless recreation. 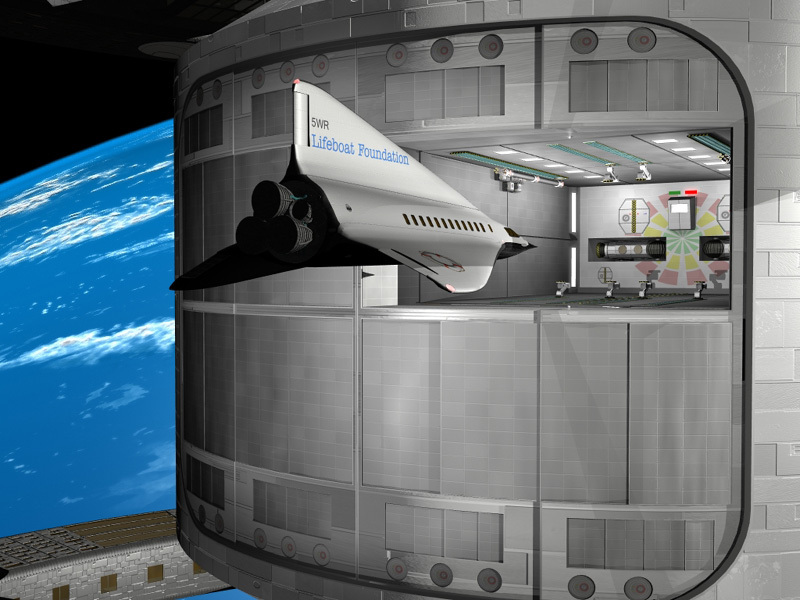 Although space colonies will have 1g at the hull, in the center you will experience weightlessness. If you’ve ever jumped off a diving board, you’ve been weightless. It’s the feeling you have after jumping and before you hit the water. The difference in a space colony is that the feeling will last for as long as you like. If you’ve ever seen videos of astronauts playing in 0g, you know that weightlessness is fun. Acrobatics, sports and dance go to a new level when constraints of gravity are removed. It’s not going to be easy to keep the kids in 1g areas enough to satisfy Mom and Dad that their bones will be strong enough for a visit to Disneyland. Zero-g construction means bigger colonies. Space colonists will spend almost all of their time indoors. It is impossible for an unprotected human to survive outside for more than few seconds. In this situation, obviously bigger colonies are better. Colonies on the Moon or Mars won’t be much bigger than buildings on Earth, especially at first. However, in orbit astronauts can easily move spacecraft weighing many tons by hand. Everything is weightless and this makes large scale construction much easier. Colonies can be made so large that, even though you are really inside, it feels like the out-of-doors. Economics. Near-Earth orbital colonies can service Earth’s tourist, energy, and materials markets more easily than the Moon. Mars is too far away to easily trade with Earth. Space colonies, wherever they are built, will be very expensive. Supplying Earth with valuable goods and services will be critical to paying for colonization. The ultimate gated community. On Earth it is essential that diverse groups learn to live in close proximity. It’s hard to live with six or seven billion homo sapiens, and some people can’t seem to do it gracefully. Space settlements offer an alternative to changing human nature or endless conflict  the ability to live in fairly homogeneous groups, as has been the norm throughout hundreds of thousands of years of human existence. Those who can’t get along can be separated by millions of miles of hard vacuum, which in some cases seems necessary. All entry into a space settlement must be through an airlock, so controlling immigration should be trivial. Custom living. Since the entire environment is man-made, you can really get what you want. Like lake front property? Make lots of lakes. Like sunsets? Program sunset simulations into the weather system every hour. Like to go barefoot? Make the entire environment foot-friendly. Launching materials from Earth is very expensive, so bulk materials should come from the Moon or Near-Earth Objects (NEOs are asteroids and comets with orbits near Earth) where gravitational forces are much less, there is no atmosphere, and there is no biosphere to damage. Our Moon has large amounts of oxygen, silicon and metals, but little hydrogen, carbon, or nitrogen. NEOs contain substantial amounts of metals, oxygen, hydrogen and carbon. NEOs also contain some nitrogen, but not necessarily enough to avoid major supplies from Earth. Ark I will have a permanent population of 1,000 people with a capacity for 500 visitors. Solar panels will provide nuclear fusion power by harnessing energy from the nearest nuclear fusion reactor  the sun. Also, four nuclear fission plants, one in the hub of each wheel, will provide Ark I with twice the redundancy of a nuclear powered aircraft carrier or submarine. Being an advanced spacecraft, Ark I will have both high-thrust and high-efficiency propulsion capabilities. High-thrust propulsion will be suitable for situations that require a rapid change in velocity and can be obtained with chemical fuels. High-efficiency propulsion will be best when spacecraft operators have time to spare and want to get the most out of a given amount of fuel. Chemical propulsion, which is used by the Space Shuttle and other large spacecraft, acts quickly and provides a lot of force. All manned spacecraft to date have used chemical propulsion. Therefore Ark I will incorporate chemical fuels, such as liquid hydrogen and oxygen, for moments that require a rapid trajectory response. There is a theoretical maximum to the efficiency of chemical fuels, however. 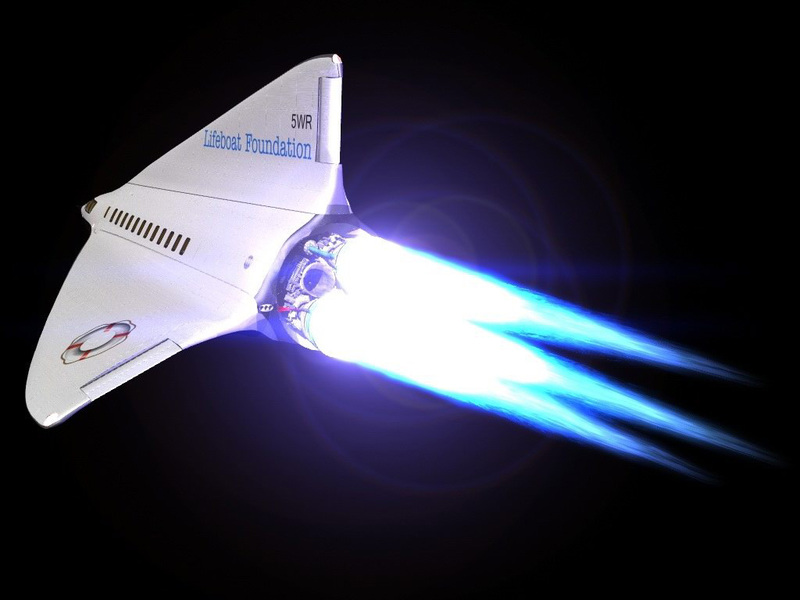 To keep the amount of Ark I’s onboard fuel at a reasonable level, more efficient ion or plasma thrusters will be used. 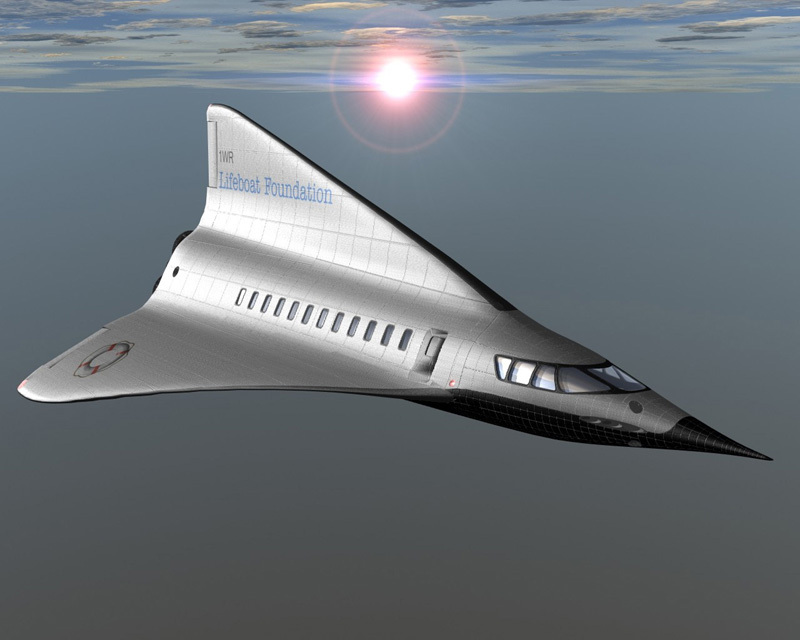 These engines can use electrical power to generate thrust, and use far less fuel mass than chemical propulsion systems. Ion and plasma propulsion, like with NASA’s VASIMR rocket, must burn over long periods of time  which will be suitable for long interplanetary travel or slow trajectory corrections. Just as the Earth’s magnetic field helps protect its residence from harmful space radiation, Ark I will have powerful magnetic fields encompassing it and diverting energetic charged particles present in solar winds away from the station. A less energy intensive alternative would be to use enormous amounts of matter, probably from lunar soil and Near Earth Asteroids, to cover the Ark I to protect its inhabitants from cosmic radiation. This would amount to ten tons of matter covering every square meter of its hull. Waste matter from NEOs could be used for this purpose. 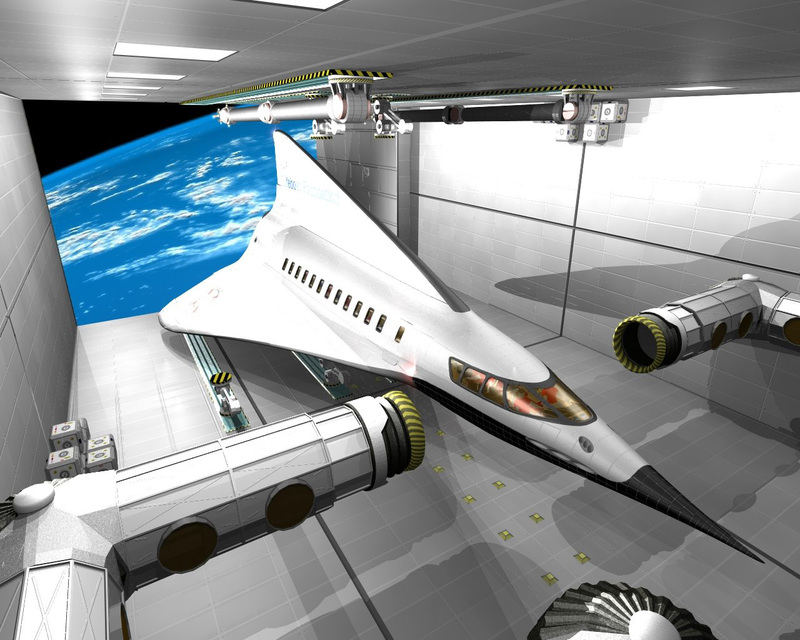 The weightlessness environment of the Ark I bridge will provide plenty of opportunities for astrobatics (weightless aerobatics) and weightless recreational opportunities, such as swimming through the air with wings and fins, and games like ‘Space Polo’ where two teams compete in a 3 dimensional game of micro-gravity polo, pushing off each other and walls. Additionally people on Earth are members of many social groups, religious, professional, or hobby orientated. People who travel to space to live, work, or vacation will take these memberships with them. Each wheel has two sets of directional thrusters, two emergency docking hatches, and one set of nuclear, ion, and chemical thrusters. The nuclear power plant that powers the nuclear thruster also provides enough electricity to power the wheel. 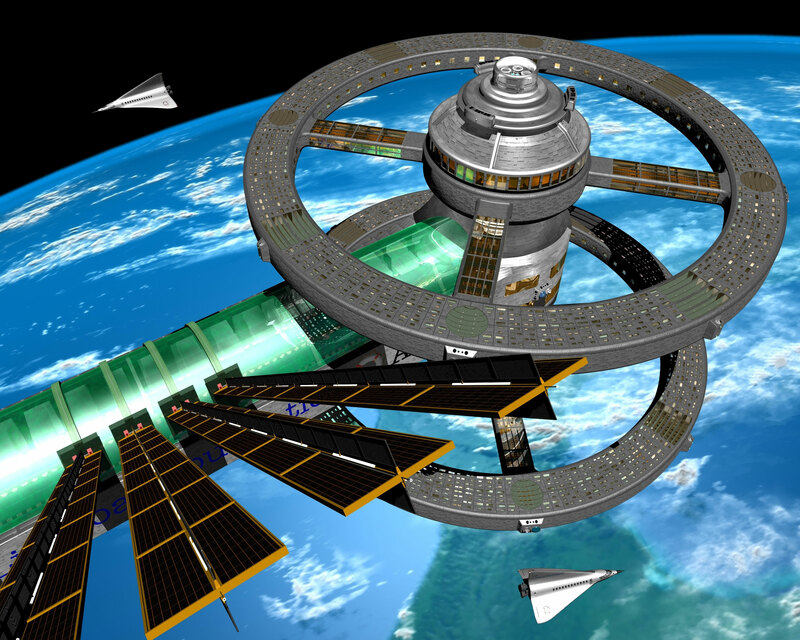 Each ring is also capable of maintaining its own independent ecosystem, making it able to survive indefinitely if the rest of the station was destroyed. At the top of each hub is a sensor mounting ring. Antennas, radar, EM domes, and telescopes are housed in protective compartments attached to this ring. Lifeboat WaveRiders, to be used by Ark I for cargo, construction and travel purposes, are uniquely designed on an operative principle very different from that of conventional aircraft. WaveRiders “surf” on their own shock waves. 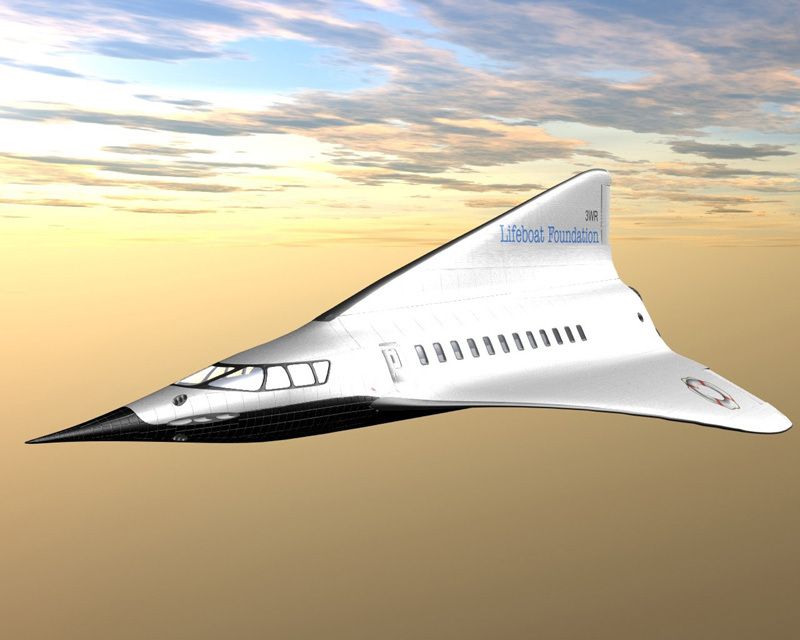 Gliding at supersonic speeds, the WaveRider’s passage through the atmosphere creates a shock wave, which is trapped in an aerodynamic trough on its underside. 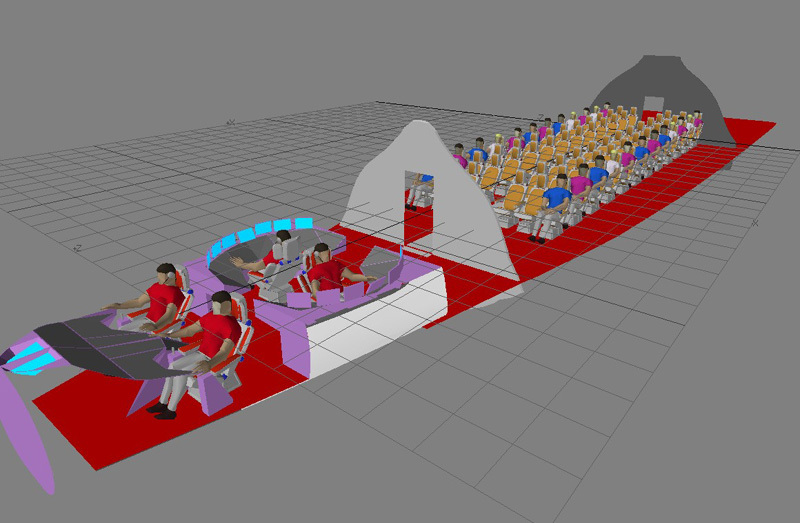 Each WaveRider can carry 72 passengers using 6 seats across, with 2 pilots and 2 additional crew. The hangar that WaveRiders dock in is not normally pressurized, instead passengers enter through an extensible tube similar to what is common at airports. All windows will have a thick (viscosity) Ferro fluid spread over a grid of wires with current flowing through them. Ferro fluids are magnetic fluids and they will conform to a magnetized structure. This thin but viscous layer of Ferro fluid will quickly fill any holes created. The temporary seal they create will be able to handle the atmospheric pressure in the station. Each wheel also has two sets of laser/radar domes that can be used to destroy small meteorites. 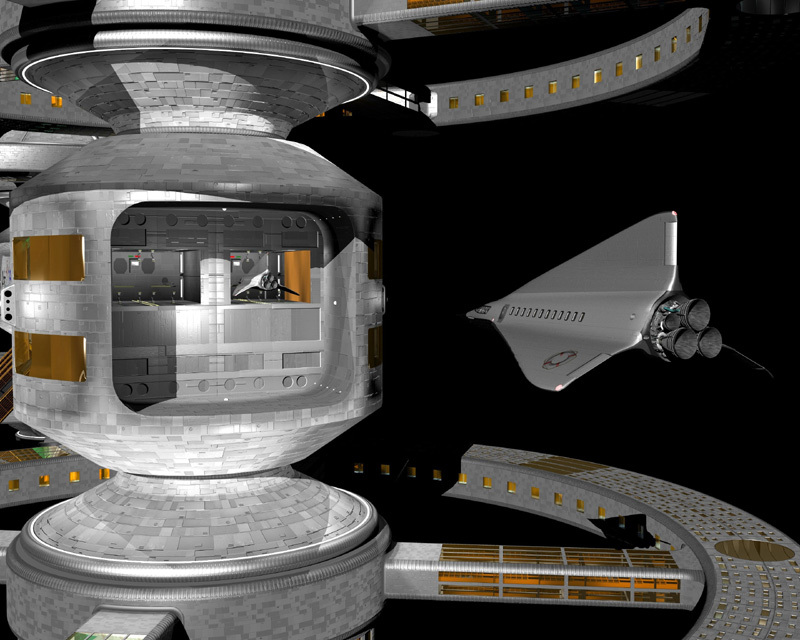 Orbital Space Settlement by Al Globus – ongoing project. 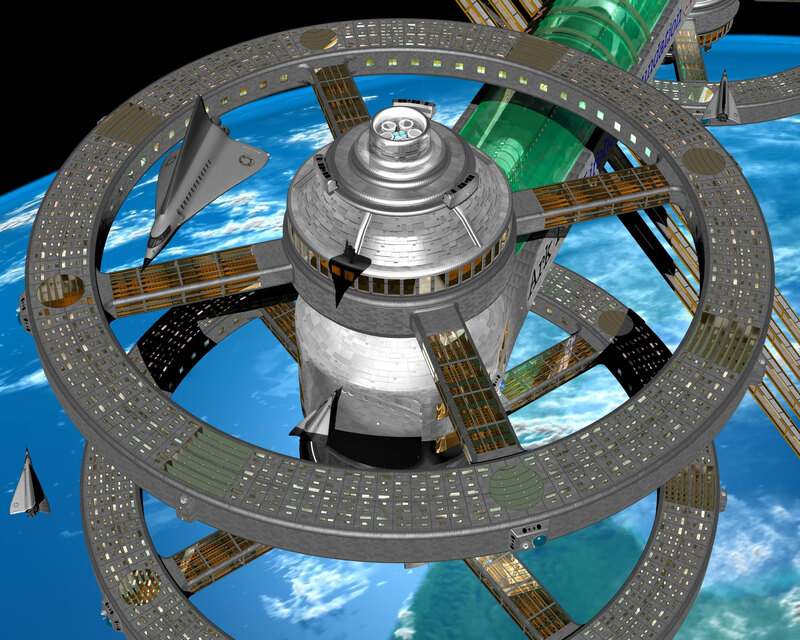 Self-sufficient space habitat designed by Carolyn Barry, COSMOS magazine – October 9, 2007.